On March 13, 2011, floodwaters lingered along the Japanese coast near the city of Sendai, in the aftermath of a magnitude 9.0 earthquake. An Expedition 26 astronaut took this photograph from an altitude of 220 miles (350 kilometers) up on the International Space Station. North is at upper right. This picture shows an area north of Sendai, and part of the city of Higashimatsushima appears along the right edge of the image. Astronauts in space have snapped photos from orbit of the effects of the massive earthquake and tsunami that have devastated Japan. 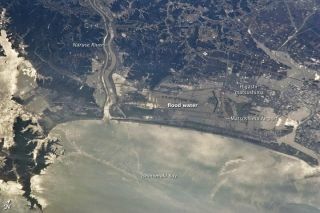 High-resolution photos taken from the International Space Station show some of the areas hit the hardest by the 9.0-magnitude earthquake and subsequent tsunami that struck the northeastern coast of Japan. "Our thoughts are with our friends in Japan," Italian astronaut Paolo Nespoli , one of the three astronauts staying at the station, wrote in a Twitter post on March 13 – the same day one of the newly released photos was taken. The March 13 photo captured by the astronauts shows how the region north of the coastal city of Sendai appeared from the station's altitude of 220 miles (354 kilometers). The image shows Japan's Ishinomaki Bay, Naruse river and part of the city of Higashimatsushima. Flood water is rampant in the view. The Ishinomaki Bay can also be seen coated in oil, which leaked from oil refineries damaged by the earthquake and tsunami. Another photo shows the coastline of Sendai and other nearby regions as they appeared yesterday (March 14) from a slightly lower altitude of about 215 miles (345 km). Through a thin haze of clouds, flooding was still discernible south of Sendai days after the massive 9.0-magnitude earthquake and resulting tsunami that struck on March 11, 2011. An Expedition 26 crew member took this photograph on March 14 from the International Space Station. JAXA built the space station's largest single laboratory. It is named Kibo ("Hope" in Japanese) and includes a huge bus-size main module, an attic-like storage room, an exterior porch to hold experiments, as well as two windows, a small airlock and a robotic arm to move new experiments onto the outer porch. Japan also provides unmanned robot cargo ships to deliver tons of supplies and hardware for crews on the space station. The second of these cargo ships, called HTV-2, is currently docked at the space station. The earthquake also damaged Japan's Tsukuba Space Center – the home of Japan's space station control room – and severed a communications link between the center and NASA's space station Mission Control in Houston, NASA officials said yesterday. In addition to the Tsukuba center, one other JAXA facility is closed and two others have had some services impacted, JAXA officials said on the agency's website. Japan has trained eight astronauts to fly in space with three more currently undergoing training at NASA's Johnson Space Center in Houston. One of Japan's spaceflyers – astronaut Naoko Yamazaki – has posted a reassuring note via Twitter to answer public inquiries of her safety. "Thanx for caring messages for the earthquakes in Japan. I'm fine. Lost electricity last night," Yamazaki wrote just after the earthquake. "Sincere prayers to those who are still suffering. And thanks to all the rescue teams." Yesterday, station astronauts expressed their heartfelt sympathies to Japan as they prepared to return to Earth. "Our hearts go out to our partners in Japan that have suffered greatly," the station's returning commander Scott Kelly of NASA said during a televised statement. "We really feel for them and hope and know they will recover from this, as the Japanese people are very, very resilient." Kelly, the station's Expedition 26 mission commander, spoke during a ceremony to transfer control of the space station to Russian cosmonaut Dmitry Kondratyev. Kelly and two crewmates are returning to Earth Wednesday, leaving behind three other crewmates who will stay on the space station. Japanese astronaut Soichi Noguchi thanked his NASA counterparts and the entire world for the outpouring of public support for Japan and its citizens. "Thanks for the kind words from all over the world," Noguchi wrote on Twitter. "Our thoughts and prayers to victims of disaster."